It is the new/old hype: creating multimedia stories on web-platforms such as Pageflow. Instead of telling your story with a film, an article, a podcast, or a photo slideshow, you use all these tools at once. When flowing through your story, your audience can watch some video, or listen to the noises while reading about far away places. If well done, this can be a very immersive and emotional experience. Multimedia stories are not necessarily cheaper to produce than stories in form of a video. An organization would probably use such a tool only for important campaigns, such as a fundraising campaign. So how can this tool be used effectively during a campaign? 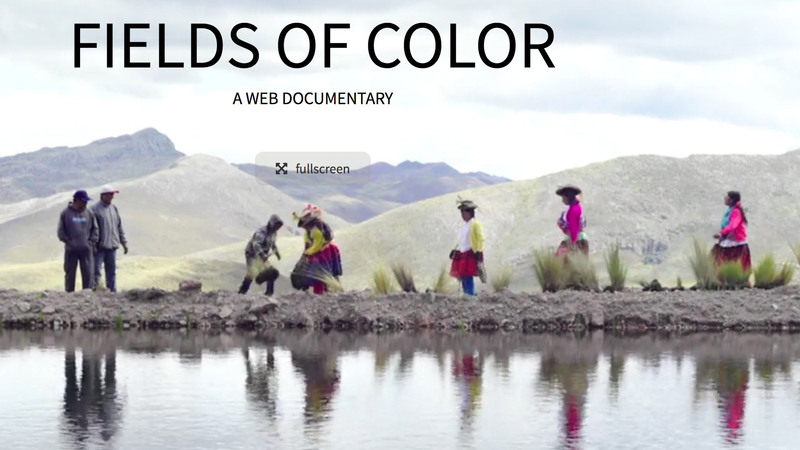 Before I give you an answer, I would like to show you a beautiful example of a multimedia story about a farmers in the Peruvian Andes. The story was produced by the journalist Elisabeth Weydt (Text) together with Jakob Fuhr (Photo, Video), Christine Anas (Illustration), and Gideon Glock, Jakob Fuhr (Programming). In the upper left-hand corner you can switch to the German version. It works, doesn’t it! You might not read all of the information, but you keep on scrolling down. And the moments you enjoy the most are those, where you don’t have to take in any information, but just watch and listen to the sounds of the place. This kind of multimedia story has a feature which is quite unique to the medium. There is this stop and go effect when you navigate through the story: you enjoy the picture and you read the information. Then you scroll down to the next story piece where you might watch a video interview. Then you scroll again. Each new window feels like a new chapter or sub-chapter. You don’t know what kind of media or information is coming next. Actually, since it is sometimes hard to see the progress bar, you don’t even know how you progress within the story! This stop and go feeling has an effect on how you perceive the story. It creates extra suspense. And it is exactly this suspense effect which can be harnessed for campaign purposes. For example to raise funds or awareness for your cause. A campaign usually takes place over a period of time. Ideally you would like to keep your audience interested in your campaign over the entire period. The multimedia story with its chapters helps you to do just this. Instead of publishing your entire story at once, you create chapters, which are published in intervals. The story progresses over the time of your campaign. Your audience comes back to find out what will happen next! Of course, you need to embed your multimedia story into a campaign on your social media channels, where you keep the story in your audience’s mind: using additional information, side stories, or moderating discussions. Here you publish the next chapter in your story. Such a strategy to tell your story hooks your audience to your campaign goal. But will the visitors act or donate for your cause? - Not necessarily. A successful campaign has many ingredients. I would like to mention only one. Every good story conveys emotions. We the audience watch a movie or read a book, because we want to be moved by the story. The above example has this power. The two sisters and their fight for their community grew on me. It is a well told story, where you want to read, or watch through the chapters and find out how the story ends. This blog post is inspired by stumbling upon good multimedia stories. Dubbed perceptions explores these new forms of storytelling with the web-design company Zeilenwerk.